If you're looking to connect with other vendors or creatives in the HoneyBook Community—and there's good reason to!—sending a connection request is simple. Once it's sent, your fellow creative will be able to approve the connection request, and you'll be notified when they do. 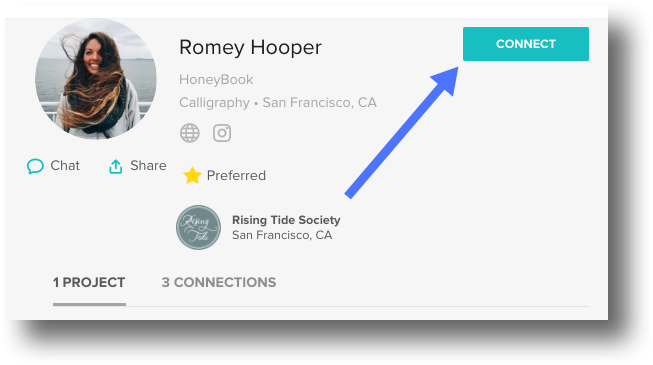 From your HoneyBook account, you can select Tools > Creatives to find a list of creatives you may know or search for particular people, then click Connect next to their name; or, use the Add Connection button to invite a fellow creative to HoneyBook! From the HoneyBook Community, just click on the creative's profile photo, which will take you to their Community profile. Then, click Connect.